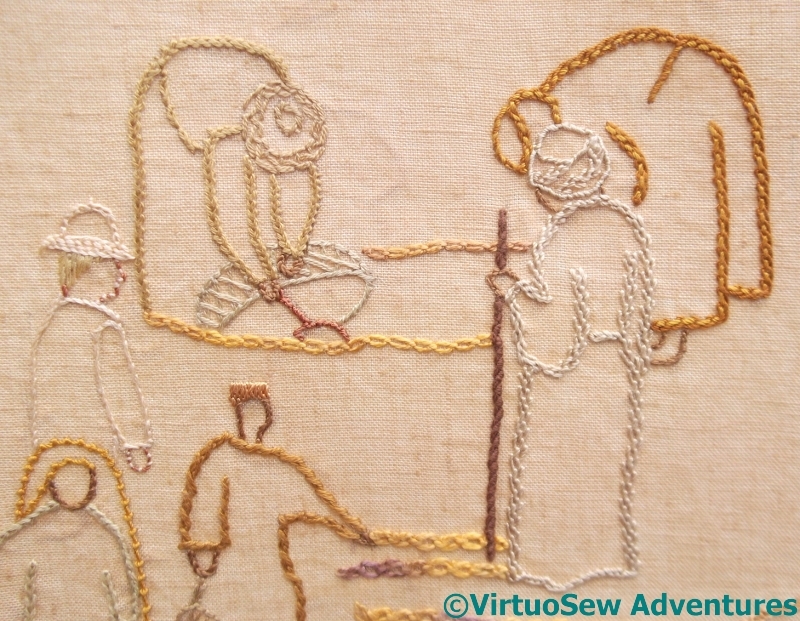 As I got nearer the foreground figures, I tried to pick broader stitches, or at least stitches that were a bit more emphatic. This group was great fun to do, starting with the Gufti with his staff of office (Portuguese Knotted Stem!). The Gufti’s robe is Feather stitch, as are some of the twists of his headgear. I concentrated very hard on keeping the stitches even and close so that the “density” of the stitch would be maintained. The one in dark gold is in double interlaced back stitch, except for the top of the headgear, and the waistline – those are whipped backstitch. 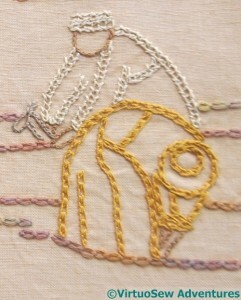 The other one is in one of the Elizabethan stitches from Jacquie Carey’s book. I had fun with the supervising excavator – the brim of his solar topee is the Hungarian Braid chain, and I reversed the direction of the chain stitch for the peak of the crown. He’s also the only one with fair hair and pinkish skin, and I dressed him in a pale, tailored jacket. The two at the front are another mixture of stranded silk, stranded cotton, and round silk thread. The golden veil is coral stitch, and the tunic below it is stranded silk chain stitch, and the dark golden tunic is stranded cotton and twisted chain stitch. I’m trying to make choices of stranded or round yarn that will suit the stitch. 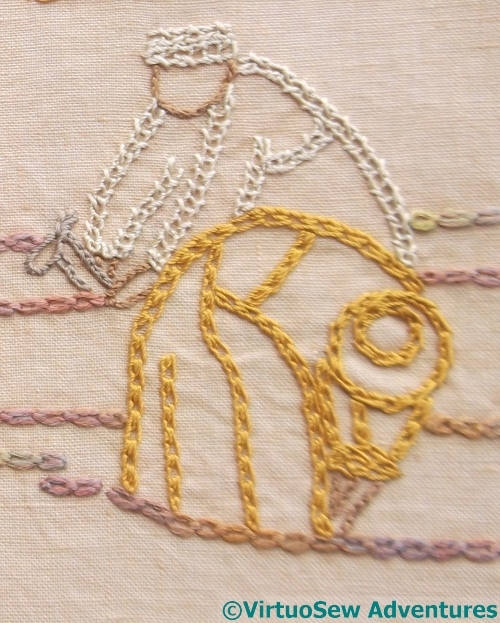 I worked these two diggers on World Embroidery Day – which I hadn’t even known existed until the day before, so I was very glad I was able to sit and stitch! I went back to my Edith John books for these two. The front one is in Shell Chain stitch, which I first used on the Circle Skirt. I won’t say it’s a favourite, but I have rather taken to it, and it creates an interesting effect. The one behind is a very peculiar stitch, a combination of twisted chain stitch and open chain stitch. It creates a very square appearance, with the twisted chain alternating from side to side of the open chain, and it is called, rather predictably, Open Twisted Chain Stitch. That’s really interesting to see. The different stitches for the outlines catch your eye and make the piece more lively. Thank you for sharing. I never thought about the effect of making the feather stitch so dense! And I love the look of the double interlaced back stitch. wonderful close up of the diggers. It illustrates how neat and precise and perfect your needlework is Rachel…. Your stitching is magnificent! I love the variety of stitches and their texture. your needlework is beautiful. i need to venture out and learn some new stitches. 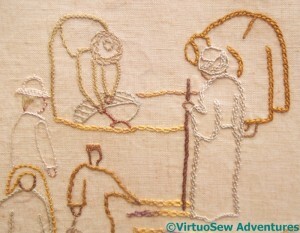 It’s wonderful seeing this coming to life, with your wonderful stitching! I love the use of different stitches. What fun. I like those two diggers. It’s becoming very lively and busy. There’s a lot of character coming out in these figures, for all their simple lines. I loved the idea of World Embroidery Day too and I think that may have been the day I started my L*K piece. I have half a memory of being glad I’d done some stitching that day…. !! Your work is beautiful, Rachel. I’m not a knowledgable embroiderer, so maybe it’s just ignorance, but I haven’t heard of a lot of these stitches. You’ve aroused a curiosity to look them up! Love the different tones and textures that the different weight stitches give. These are fabulous! I love the texture differences with the various stitches. I like your idea of using the different stitches in this way and I will be looking them up too. I think I need to start a sampler book for the stitches I’m learning, but it’s hard to remember them if you don’t use them often. Lovely work, Rachel. Your little figures have turned out very well. I really like that open twisted chain stitch. It leaves me with the impression that the clothing worn by this man was natural cotton with a tan coloured stripe running through it.